That Naoki Urasawa! So brutal! TEETH! A good way to put it! I loved Monster, which absolutely had that same Watchman-eque sadness about it as well. It might have to do with the plausibility of the story despite the surreality of some of the plot. Urasawa likes to play with the past in a very interesting way. Thanks for posting the review, I'll have this on my to-read list asap. It really is a must read. Hey, I will prolly end up owning this series, so you can maybe pick up the manga from me when we do our trip? Oh, how did Unwritten go over in your house? I haven't read this, but I'm deep into Monster, which is just amazingly well-written, rivals Nabokov in my opinion for keeping me intrigued and on the edge of my seat. @Susan and Joshua..._Monster_ is amazing, isn't it? Urasawa is so good at tension and subtlety in his analysis of human nature. And Johan Liebert is a truly terrifying character. @Billiam Shakespeare--No news yet, It's on the bedside table, and I called dibs on the second read. I'll let you know what we both think. 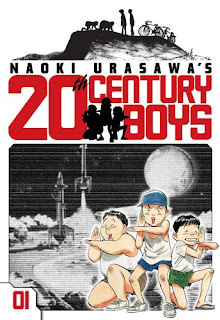 Twentieth Century Boys is the best! I can see what you meant about the story being like Watchmen: there's a mystery surrounding a member of a small, defunct group dying, and the remaining members have to unravel what is happening while suspecting that it was one of the group who committed the crime. Also, they're both really good.